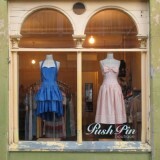 Vintage clothing, jewellery, bags and general finds. We also provide a personal shopper service…you message what you are looking for and we contact you if we find it. Pretty Dress is a Western Australian based online retailer specialising in vintage and retro inspired womens clothing and accessories. Vintage Clothing for Pretty Hot Ones. Find us at Lost & Found Market, 511 Lygon Street, East Brunswick. We have established a home for all things Vintage, Antique, Vintage Inspired Collectable & Retro .